SUDBURY, ONTARIO--(Marketwired - March 17, 2014) - Northern Superior Resources (TSX VENTURE:SUP) ("Northern Superior" or the "Company") 100% owned Ville-Marie diamond property located in west-central Québec (Figure 1), is a project of opportunity in a revitalized Canadian diamond sector. Northern Superior's predecessor, Superior Diamonds Inc., completed extensive diamond exploration from 2003-2008 on the original Ville-Marie property discovering two kimberlite pipes and defining a series of (10) high-quality kimberlite targets. As a consequence, the Property was maintained to include the key assets in Northern Superior's portfolio: the Morin kimberlite pipe and the 10 targets (Figure 2). Due to a renaissance in Canadian diamond exploration, it is important to remind the industry of the potential of the Ville-Marie property. The Company is seeking an option partner to advance exploration in 2014. 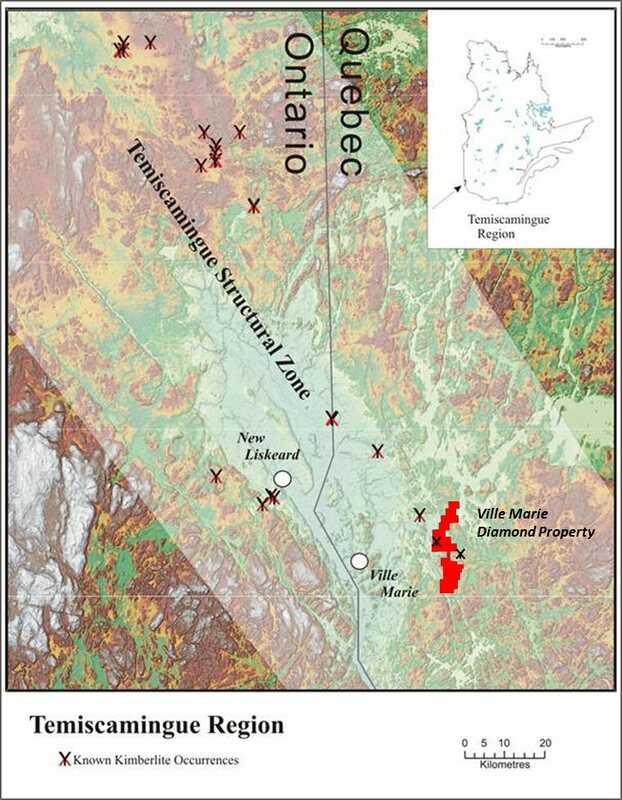 The highly prospective Ville-Marie diamond property is situated within the Temiscamingue Structural Zone (TSZ- Figure 1). The Property consists of a large contiguous 130 claim block (6,532 hectares), located within the core of the well-defined TSZ which represents an area of the Superior Craton that is considered prospective for diamondiferous kimberlites. Two kimberlite pipes have been defined to-date: the Morin diamondiferous pipe and the Honorat pipe (untested for microdiamonds). A yellow transparent microdiamond was recovered from the Morin pipe in 2007 from only 6.92 kilograms of crater-facies kimberlite drill core. Diamond indicator mineral geochemistry from the Morin pipe confirms that the area has the potential for the discovery of diamond-bearing kimberlites (see press release, Superior Diamonds Inc., September 20, 2007). The discovery of the Morin and Honorat pipes provided key signatures that serve as extremely important exploration guides elsewhere on the Property. The 10 targets defined by Northern Superior (Figure 2) are based on these signatures and include: a) the distribution and concentration of KIMs (including G10 Cr-pyrope garnets, pyrope-almandine (eclogitic paragenesis) garnets, high Cr-chromites, kimberlitic ilmenites and Cr-diopsides; b) kimberlite float (same suite of KIMs); and c) magnetic and gravity geophysical anomalies. Dr. T.F. Morris comments: "Given the renewed interest in Canadian diamond exploration, Northern Superior has made a strategic decision to find a partner to advance the exploration on this high potential Property. With 10 untested kimberlite targets defined within a proven kimberlite field, the potential for success is high. All of these targets are easily accessible in a region that is supportive of exploration. Northern Superior will be aggressively looking for a partner to move exploration on this Property forward as we continue to focus on our gold properties." The Company's Qualified Person ("QP") for the Ville-Marie property is Scott Parsons (MSc., MBA, P.Geo.). As the QP, Mr. Parsons has prepared or supervised the preparation of the scientific and technical information for this program and has verified the data disclosed in this press release. To view Figure 1, Property location, Ville-Marie, Quebec, please visit the following link: http://media3.marketwire.com/docs/sup1.jpg. To view Figure 2, Ville-Marie property, location of the Morin kimberlite pipe and proposed kimberlite targets, please visit the following link: http://media3.marketwire.com/docs/sup2.jpg. Northern Superior is a junior exploration company exploring for gold in the Superior Province of the Canadian Shield, specifically in the Provinces of Québec and Ontario (see Company web site, www.nsuperior.com) in the Stull-Wunnumin (Ontario) and Chibougamau-Chapais (Québec) gold districts. Northern Superior is a reporting issuer in British Columbia, Alberta, Ontario and Québec, and trades on the TSX Venture Exchange under the symbol SUP.